TOPS Knives turned 20 years old in October 2018 and to commemorate the accomplishment, we released a limited run of the Tom Brown Tracker #3 made with special steel, handles, and sheath. The success of that model led us to make this next 20th-anniversary edition model. 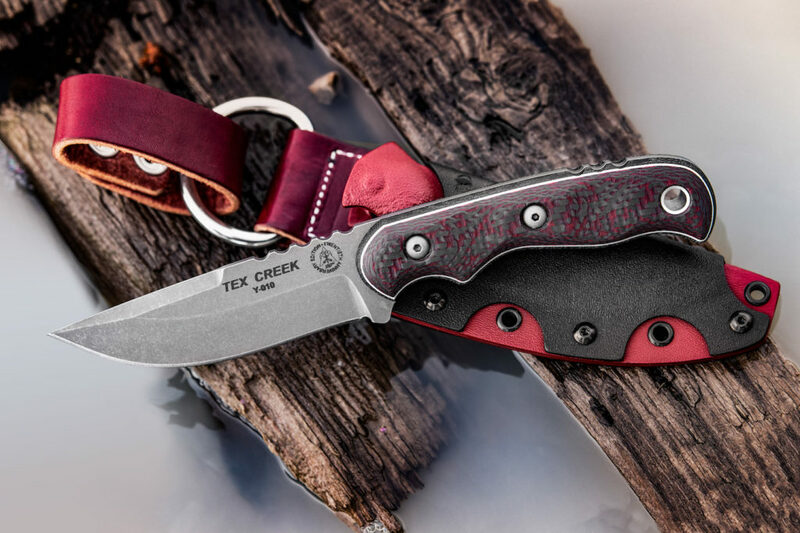 The Tex Creek is an excellent all-around knife design. It’s perfect around the campsite, if you’re out on a hike, fishing for the day, and makes a great hunting knife as well. 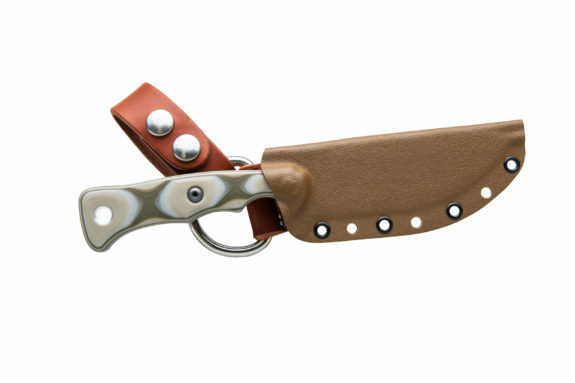 The original was designed by Leo Espinoza to be his personal hunting knife for deer season in Idaho a few years back. Tex Creek is the name of the unit where he grew up hunting in Idaho. This will be a one-time run made with CPM154 steel hardened to 58-60 on the Rockwell C scale. It has thick, well-rounded handles with a white liner sandwiched between black canvas Micarta and a gorgeous red/black carbon fiber on top. The sheath is red Kydex with black Kydex on top and a burgundy leather dangler to finish off the package. 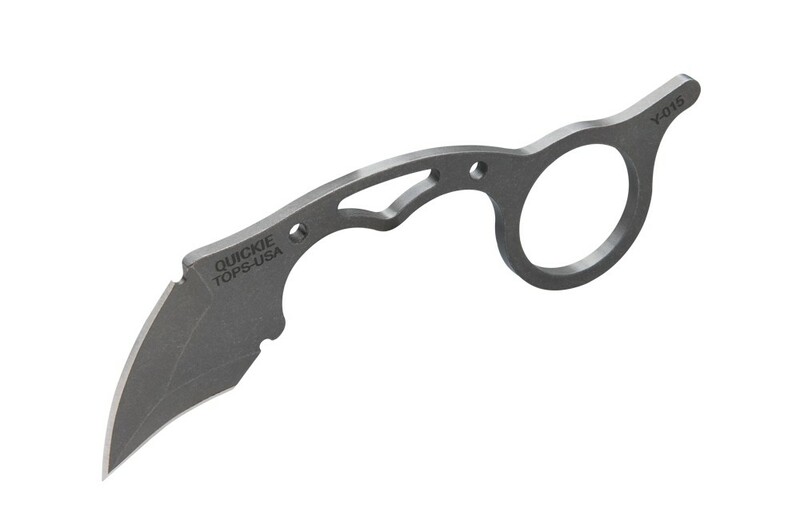 Everything about the Rapid Strike makes it an excellent combatives blade. The cutting edge is long enough for good slashing cuts and thrusts. It can be single or double-edged to meet legal requirements or be even more dangerous. The G10 handle is strong and grippy and combined with the recessed jimping that goes all the way around the handle, it’s easy to keep it in your hand when you need it the most. The sheath was designed to allow for a combat grip straight out of the sheath (meaning the hand doesn’t have to be readjusted to grip the handle properly after it’s removed from the sheath). The thin blade material and narrow profile take up little space on a belt, on a vest, in a boot, or wherever else you choose to carry it. 154CM stainless steel was chosen to provide a strong blade with little maintenance needed to keep it clean and sharp. So whether you’re deployed to one of the current hot spots around the world, serving and protecting in your neighborhood, or just a prepared citizen who wants something to help get you home safe, the Rapid Strike is perfect for you. Plus it makes a great steak knife too. 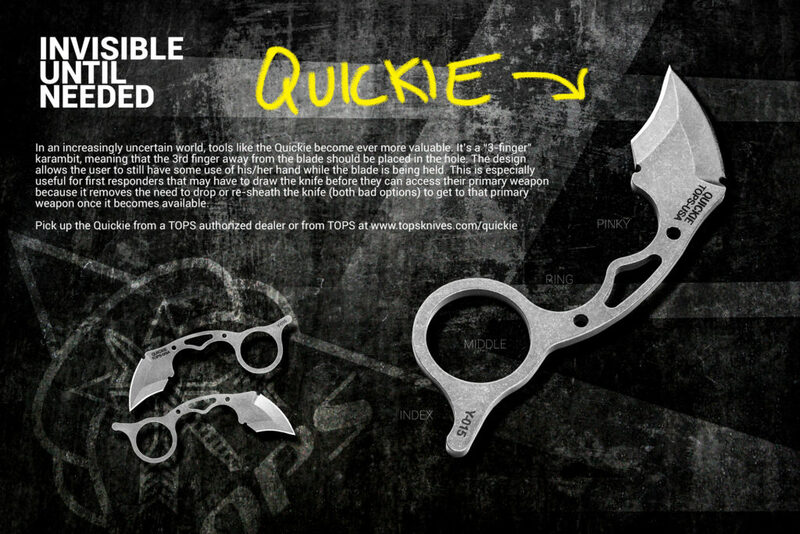 Check out the Rapid Strike at TOPSKnives.com. In an increasingly uncertain world, tools like the Quickie become ever more valuable. It’s a “3-finger” karambit, meaning that the 3rd finger away from the blade should be placed in the hole. The design allows the user to still have some use of his/her hand while the blade is being held. This is especially useful for first responders that may have to draw the knife before they can access their primary weapon because it removes the need to drop or re-sheath the knife (both bad options) to get to that primary weapon once it becomes available. 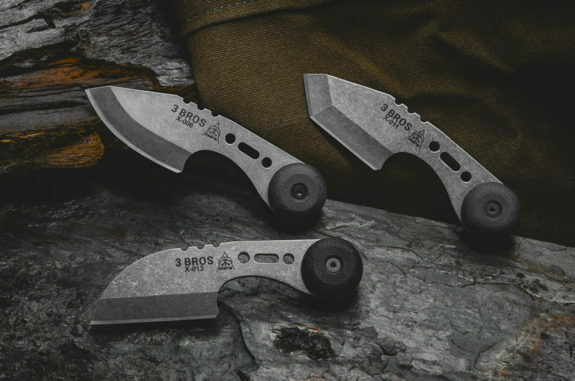 TOPS Knives just rolled out the 3 Bros – a trio of compact fixed blade knives that they have shown at trade shows. These knives feature really interesting handles that you have to hold to understand. The thick micarta disks on the handles add enough swell to anchor these minimalist knives in your grip. These tiny fixed blade knives pack a lot of use into a very small package. With an overall length of less than four and a half inches, they’re also very easy to carry every day. Each blade is about two inches long and TOPS has decided to offer it with three different styles: Hunter, Tanto, and Sheep’s Foot. They may be small, but TOPS didn’t skimp on the quality. When you need the functionality of a utility knife with the strength of a fixed-blade, the 3 Bros are what you’re looking for. TOPS Knives turns 20 years old today! That represents 20 years of continued relevance in a fickle market, 20 years of American (Idaho to be specific) manufacturing, and 20 years of great knives. TOPS Knives just released the Camp Creek, their first production knife to use S35VN stainless steel. This knife appears to have a lot of great features including being ground from thin 1/8″ steel stock, a bull-nose skinner profile, and a kydex dangler sheath. The combination of tough S35VN steel, thin stock, and a tall flat primary grind should make this knife an excellent cutter. Every year, TOPS’ President Leo Espinoza makes himself a knife for hunting season. Sometimes that knife ends up being a TOPS model. The Camp Creek is one of those. The goal with this model was to make a super high quality hunting/camp knife using materials that are uncommon for TOPS. Hence the use of CPM S35VN steel, 3 color camo G10 handles, and a stylish Kydex sheath with a leather dangler. The superior design, fit and finish, and material selection combine to form one of the best hunting knives ever to grace TOPS’ lineup. 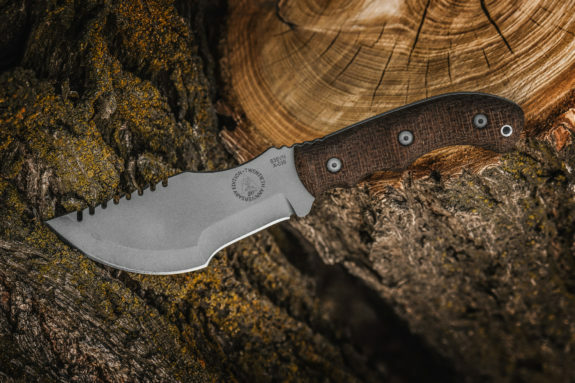 The Tom Brown Tracker is one of the most iconic survival knife designs on the planet. It has also been one of the highest selling TOPS models in the 20 years that we’ve been in business. 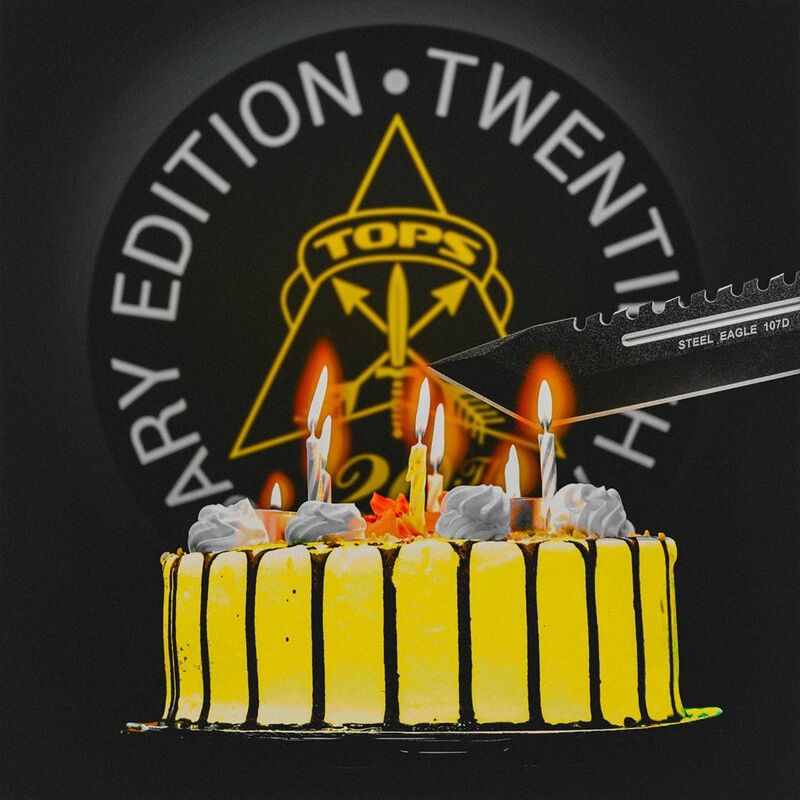 So it only makes sense that one of the TOPS’ 20th anniversary limited edition knives be a Tom Brown Tracker. We decided to use the Tracker #3 specifically. It has been upgraded from 154cm to S35Vn steel, Black Linen to Brown Burlap Micarta, and standard Kydex to custom quality burgundy leather. This is one that will definitely become a collector’s piece for many. 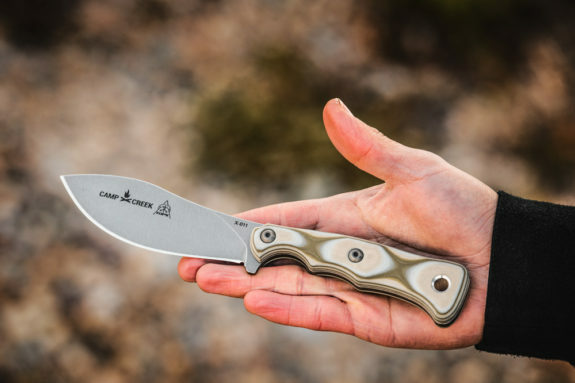 The Tundra Trekker is the newest knife from TOPS Knives and if you love big choppers, you’re going to love this. It has Kukri bloodlines with dose of TOPS style and it is clearly made to wreck whatever you put in front of it. The Tundra Trekker is a Kukri-esque design that has the blade heavy balance and general shape of a standard kukri with TOPS unique style. 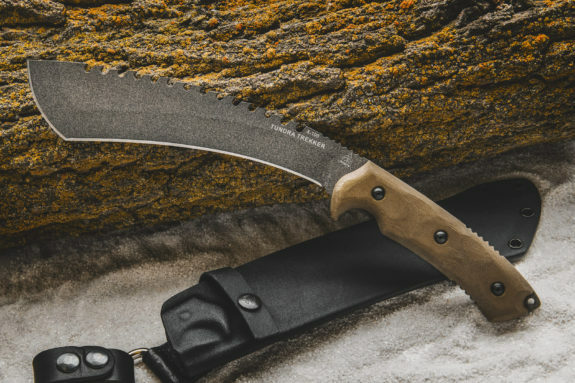 It has a robust powder coat finish, comfortable handles, opposing pitch saw teeth, and a forward curved blade all designed to excel in several uses. Anything from chopping wood, to making traps and tent pegs, clearing brush, and whatever else you might decide to throw its way. The open backed Kydex sheath comes equipped with a dangler to make it easy to carry through thick brush and trees. 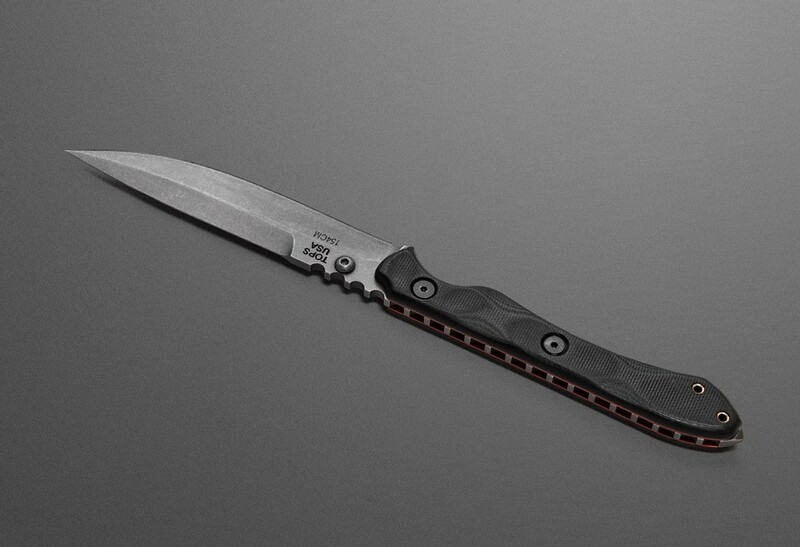 This is a great option for those looking for something in the 9” blade range. TOPS Knives has released their new Backpacker’s Bowie and it scores some major nostalgia points with me. When I was a teen, a good friend of mine had a Jet Pilot Survival Knife that I thought must have been the coolest knife in the world. 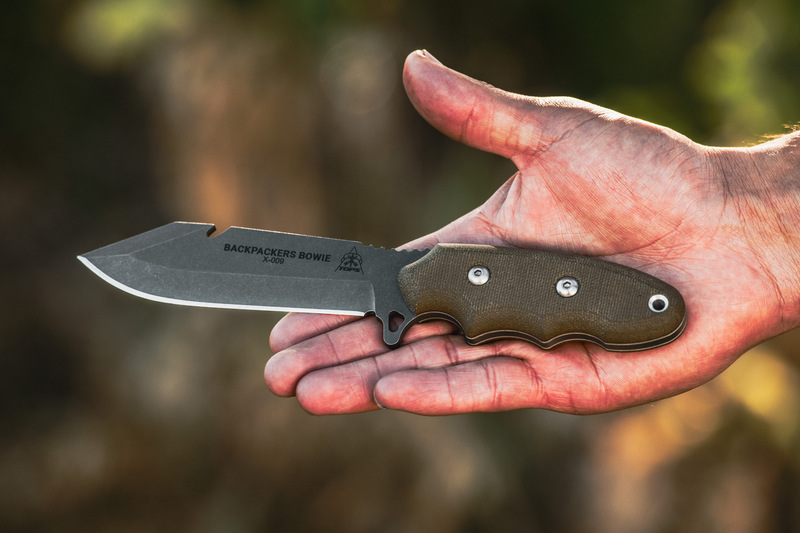 The blade shape and grind of the new Backpacker’s Bowie bears a strong resemblance to that iconic knife. When I am backpacking, I want a knife that is stout but not dead weight. The Backpacker’s Bowie weighs in at just over 7 ounces. It is stout enough to help with emergency tasks like wood processing and shelter building. It is also useful in camp with its built in pot lifter notch so you won’t have to wait for an emergency to use it. Bowie knives have long been popular among knife enthusiasts. They are versatile in a wide range of uses. Most Bowies are larger knives, however. TOPS set out to make a shorter version that even a backpacker would carry (every ounce counts). The result is a 4” blade that could be the most important piece of kit that goes on the backpacking trip. Aside from the normal uses a knife affords, the notch on the spine is for breaking wire or pulling a pot out of the fire and the swedge can be sharpened upon request. The Backpacker’s Bowie, because you should always carry a knife. 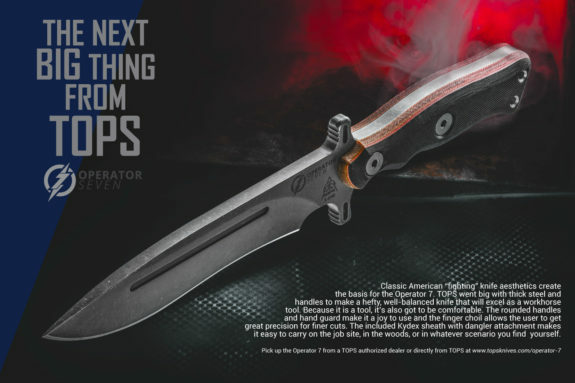 Everything about the new Operator 7 from TOPS Knives is overbuilt. It is ground from .31″ blade stock which is far thicker than most knives. It has double layered micarta slabs on the handle for a hand filling grip and a striking appearance. It is a tank of a knife. Classic American “fighting” knife aesthetics create the basis for the Operator 7. TOPS went big with thick steel and handles to make a hefty, well-balanced knife that will excel as a workhorse tool. Because it is a tool, it’s also got to be comfortable. The rounded handles and hand guard make it a joy to use and the finger choil allows the user to get great precision for finer cuts. The included Kydex sheath with dangler attachment makes it easy to carry on the job site, in the woods, or in whatever scenario you find yourself.